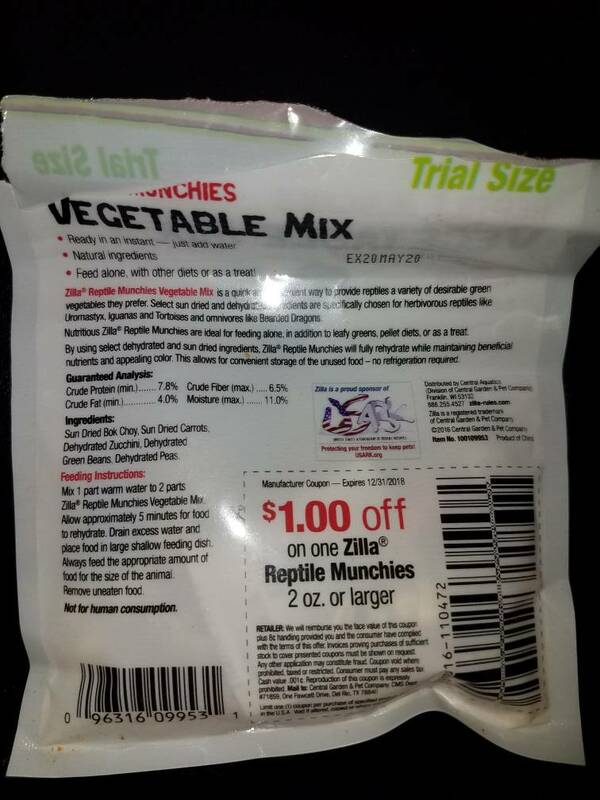 While I was wondering in petsmart and saw this veggies mix in both large and trial size. Because the item is all sun dried or dehydrated veggies and that would make a great food supply for long term in case of vacation when I can't change food regularly. I bought the trial size and the crabs seem to love it everytime I introduce it in their tanks. But, i just wanted to make sure that this item is safe for my crabs. Here is a photo of it. The ingredients look good to me! Yep, the Zilla Munchies are safe. Because the food is freeze-dried, it can turn to mush and mold quickly in high humidity. Figuring out the dryest place for the food dish to prevent that from happening will help.